L’COOL’LIKES: Bieber & Hilary Swank | Everything is cool. It’s been bugging us so it must have been bugging you, but we’ve finally cracked it! Brandon, aka. 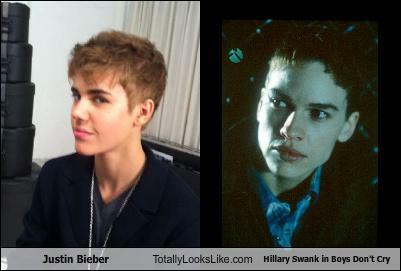 Hilary Swank, in the 1999 transgender film, Boys Don’t Cry, and Justin(e) Bieber are freakily similar. Apparently, we’re not alone in this observation as Totallylookslike.com got there first. The question is, would Selena do it with Hilary? And would that be wrong? We think it would. On many levels. I think this web site contains some very good info for everyone. “Good advice is always certain to be ignored, but that’s no reason not to give it.” by Agatha Christie.